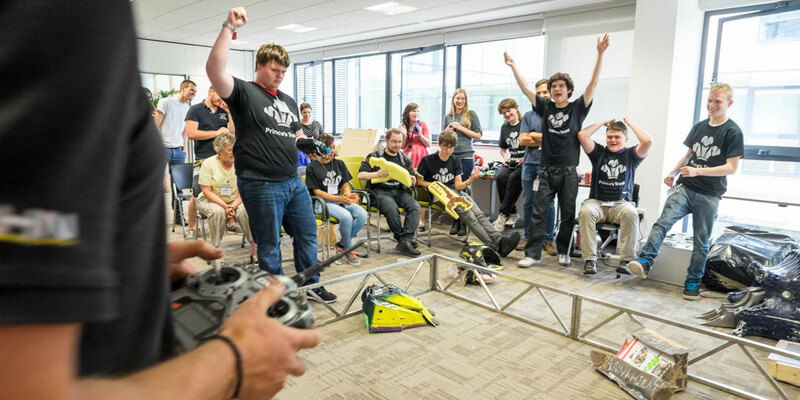 Our robotics programme works alongside partner Roaming Robots, the organisation behind the hit TV show Robot Wars. Together they build robots from scratch, and then conduct an all-out robot battle. Team working! The young people were able to meet new people and work closely together to make their robot the best, which encourages hard work and commitment. They also had tasks that were used to ensure that each team member contributed to the project, listening to each other’s ideas and incorporating them into their collaborative robot design. During the course, young people work in teams alongside Roaming Robots to research the various materials they could use to build a robot, how robots are controlled via remote, and the design and building process. They then split into groups and work together to design and build their own robot and remote control. This process requires learning about the theory and safety of pneumatics, design, welding, engineering and mathematics. Nadine, 22, from Stoke on Trent, took part in one of our Robotics programmes. She was particularly keen to progress to a career within welding. By the end of the Robotics week, she had enrolled on a 3 week Welding course with Stoke College. This will give her level 1 and 2 qualifications in Welding, which she then intends to use to take the first step towards employment within the sector. I thoroughly enjoyed the whole week, I loved the welding and I would like to continue with this. I now have a future to look forward to. In addition to STEM skills and becoming comfortable with design and engineering concepts, young people develop other transferable skills during the robotics course, such as pitching, teamwork and resilience. Before they build their robots, the young people participate in a Dragons Den-style activity, pitching their design to Roaming Robots staff. They then build their robots, and finish the course with a battle competition, in which teams battle their robots until destruction – leaving one robot the winner. After each competition, there were always the winners and losers. However this made each person more determined to enhance their design or brush off the defeats to succeed. Roaming Robots were excellent at grabbing the young people’s attention by showcasing their own large robots, planning engaging sessions, and supporting their creativity and personal development within technical work. In addition, interested young people were offered work shadowing opportunities to join Roaming Robots in their frequent showcasing events. Our partnership with Roaming Robots allows for the continued running of our popular robotics programme, so we can continue capturing the enthusiasm and creativity of young people, and supporting them with skill development for their future.